Because Ray did his already, that’s why. Here’s what looks most interesting to my eyes, though my track record of actually blogging what I say in my previews tends to be rather…low. Mokke–it was the trailer that drew my interest in this show, as well as the concept, two sisters who have differing supernatural abilities. It does seem to be pitched in the same direction as Dennou Coil (ie, for younger audiences), but if it’s as original and inventive as that show it’ll be a winner. The emphasis is not on the dark side of supernatural stuff but as an adjunct to a more slice-of-life type show, which is my favorite genre of anime when it’s done well. Sketchbook–once again, it was the preview that drew me in, with its Brahms piece. (I’m a sucker for good music.) The premise reminded me too much of Hidamari Sketch, which I couldn’t get into (sorry Fred!) and the character designs looked a bit too cutesy for my taste. But if it’s as calm and relaxed and unpretentious as the trailer, it might be one of those “sit back and relax” shows for me. 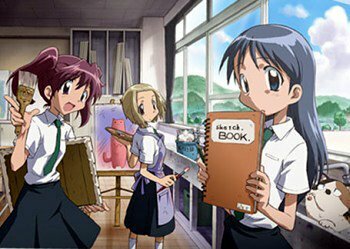 At best it turns into another Azumanga Daioh, though I doubt it; that was a unique moment of comic genius that is very, very hard to top. Even by Lucky Star. 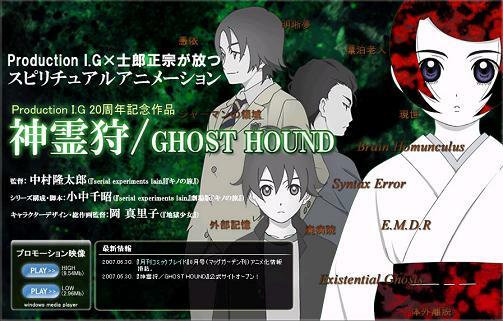 Ghost Hound–if there was ever a show that would be fodder for my more analytical side, this would probably be it. Ray’s already described it in his fall preview as “ghostpunk.” Lain writer + Shirow = intellectual WINNAR. 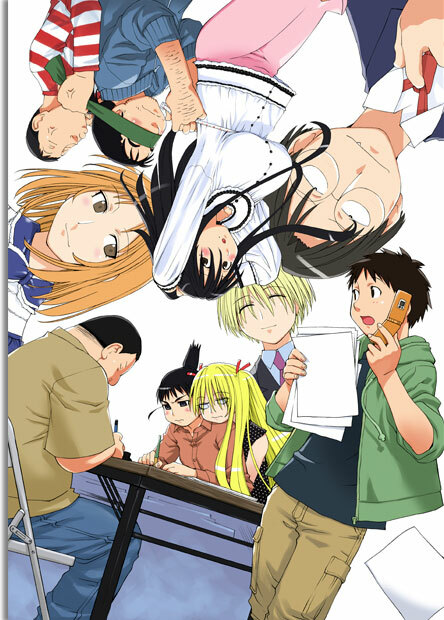 Genshiken 2–but of course. I must continue this show! See Ray’s comments on it. It looks like the fall isn’t going to be as spectacular a season as the spring promised to be, with a lot of quieter shows making their debut. All the moe otaku are going to be salivating over Clannad, KyoAni’s latest venture, but me, I’m holding the torch until the second season of Haruhi Suzumiya no Yuutsu comes out. I still can’t believe the director of Honey and Clover and Nodame Cantabile would actually direct a very standard harem show, Kimi kiss pure rouge. I may even check it out just once to see if he does anything special with it. The H&C halo effect is strong.Finally, it seems that no one is challenging Sayonara Zetsubou’s Sensei‘s originality crown so far…unless they’ve got something coming in the winter I don’t know about. I suspect, Owen, that H&C’s strength had a lot more to do with the original source material (Umino Chika’s manga) than the director per se–though up to this point he has shown excellent taste in choosing projects (Nodame Cantabile was the follow-up). It IS possible to redeem certain genres, though, in the hands of skilled writers and directors, so I’ll be cautiously hopeful. CHESS??????????????????????????? An anime about CHESS??????????????????????????? chessmaster–it’s actually shougi, Japanese chess. That wasn’t clear in the summary I read that this article was based on, but further research confirms it.